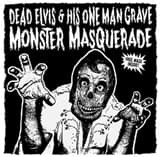 The FIRST Dead Elvis record is back on 10"vinyl!!!! Only 300pcs + BONUS TRACK included!! Taking care of business from the grave! Re-released! 12" RECORD. TWELVE SONGS FROM THE KING OF ONEMANBAND ZOMBIE ROCK'N'ROLL..!! It's a "MONSTER MASQUERADE"